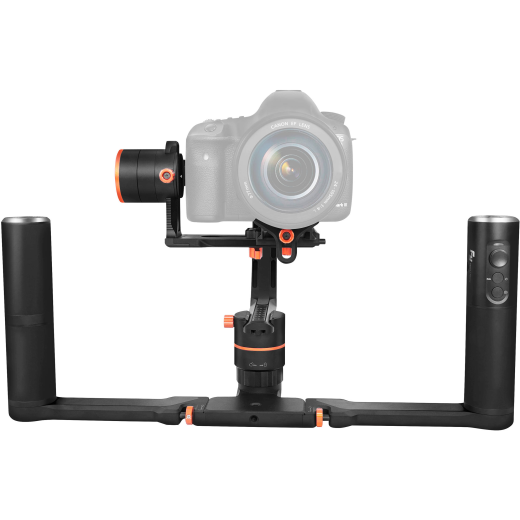 The Feiyu a2000 3-Axis Handheld Gimbal offers unlimited 360° rotation along all three axes: pan, tilt, and roll. It supports up to 4.4 lb loads, which includes most mirrorless and DSLR cameras, and features four operational modes and a flat, 4-way control joystick. The handle can be removed and the gimbal section used separately (e.g. mounted on a tripod or monopod). There are multiple 1/4"-20 mounting holes all around, including on the gimbal section and the bottom of the handle. Included as a free download with the a2000 is the Feiyu ON app for iOS and Android, which allows you to remotely control the gimbal when you have it mounted on a tripod or other support. The a2000 is designed with multiple intuitive features, including an identification algorithm that detects the weights of different cameras and matches with them without requiring adjustment of the motor strength. Panning and Tilting Mode: The rolling direction is fixed, and the camera lens moves according to the hand movement of the user. Auto-Rotation Mode: The user sets a rotational path with their hand, and the gimbal moves along that path at a constant speed.